Ships with any qualifying order over $25. 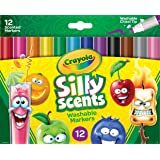 - Featuring fun and flavorful scents, Crayola Silly Scents Scented Mini Twistables Crayons add a sensory dimension to kids' artwork. 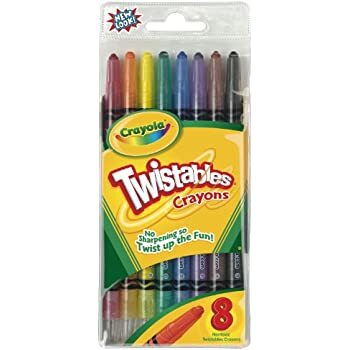 - Thanks to a convenient twistable design, these crayons never need to be sharpened. Simply twist the barrel to advance the crayon and refresh the tip for crisp lines. You won't need to use a crayon sharpener or peel off paper labels. 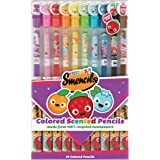 - Crayola Silly Scents Scented Mini Twistables Crayons feature durable plastic barrels encasing the crayon core, offering added strength to keep the crayon from breaking if too much pressure is applied while coloring. 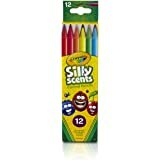 - Pack of 12 Crayola Silly Scents Scented Mini Twistables Crayons. 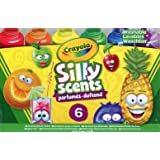 Twist up sweet scents and add flavor to your coloring fun! 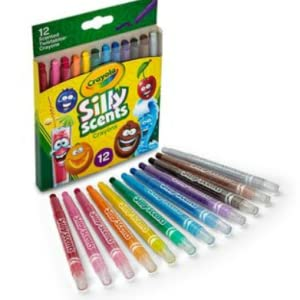 Crayola Silly Scents combines fragrant scents in a cool, colorful line of crayons, markers, and colored pencils! Each aromatic art tool comes ready to scribble and sniff. 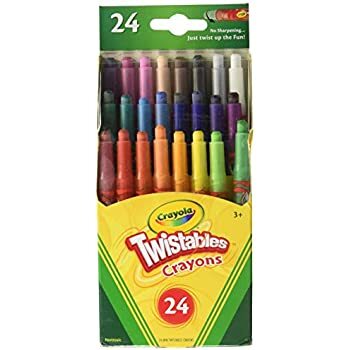 This 12 pack of Mini Twistables Crayons includes Cherry, Orange, Lemon, Apple, Beach, Blueberry, Grape, Tropical Punch, Cotton Candy, Licorice, Coconut, and Root Beer. 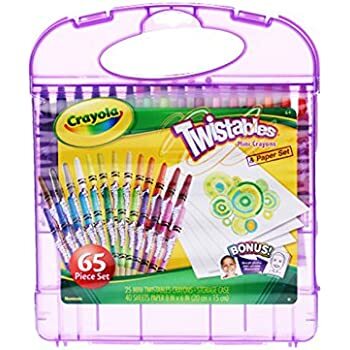 Twistables never need sharpening, making them great kids' crayons for classroom assignments, homework projects, or on-the-go coloring fun. My hurricane toddler has had these for a month and they are still working! Normally she destroyed everything in her path but someone these are still alive. She uses them daily. They don’t mark on skin so I’m not worried about my toddler making my Twin infants into zebras. I got a screaming deal on this as an add-on. I work with special needs students and purchased this for our prize box. They earn coins each week, and on Fun Friday, they count their coins and can spend them on something from the prize box. They have so much fun and have no idea they're doing math! 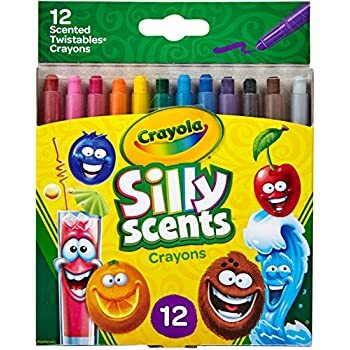 Thank you, Amazon for offering such a great deal on these crayons! 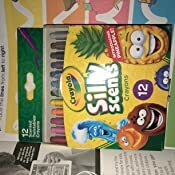 My kid likes these better than traditional crayons because of they twist out to use. They feel like a marker in hand but color like a crayon . They just aren’t as super fragrant as the silly scents makers. 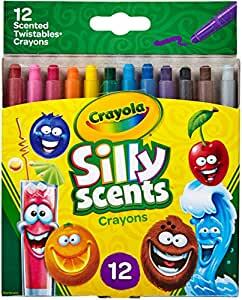 I bought these by mistake, thinking they were the markers, but they are still good for crayons. 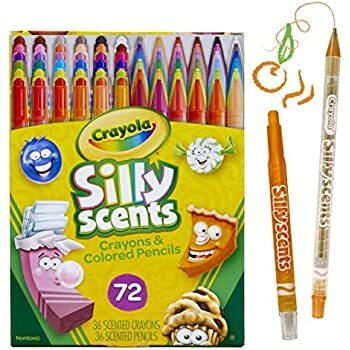 These crayons are portable, fun, and easy to use. 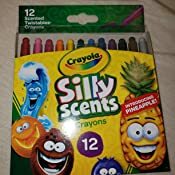 They are great for my daughter because they offer a variety of colors without being overwhelming to clean up and put away. She can use them like a pencil and twist when low. She loves to smell them and talk about what they smell like. 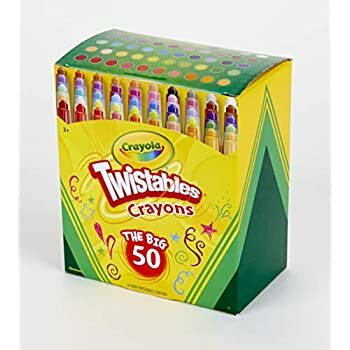 If dropped they last however we did drop The Who container off the kitchen counter onto the tile and many crayons broke inside so I had to buy new ones because once the crayons are broken inside they no longer twist up inside. Affordable to replace if broken but if one rolls off the table they don’t usually break just the whole package falling from counter to floor together broken several. Great product and happy to buy again and again! 5.0 out of 5 starsHappy kid, happy mom! My kid goes to year round school, and her school started earlier comparing to traditional schools. 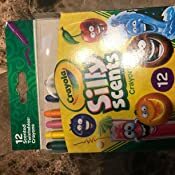 She noticed this particular scented twistable crayola from her classmates, and asked me if she could have one for the new school year. Like all busy parents, I couldn't really find time to go to the stores, and just looked it up on Amazon. Bought my set from the warehouse deal, but I couldn't tell the package was damaged at all! I remember my childhood vividly that I could always get something a bit fancier than normal from my parents. Now my kid is happy with this purchase, and I'm a happy mom, too! 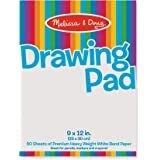 I bought these as a Christmas gift, so I don't actually know how they work on paper. All I know is that the packaging looks nice. It's brightly printed and there is a list of colors and their corresponding scents on the back. The whole box together is about the size of a plastic CD case. The one thing I did notice is how strong the scent is. When I opened the envelope after getting it in the mail, this was all I could smell. It was almost overpowering until I left it out for a while, then it was much more pleasant. It kind of smells like the PEZ candy when they're all packaged together, but individually, they do each have their own amazing smell. I got these for babysitting a friend's sons - ages 2 and 5. They love them and colored most of the time they were over. Hint - The first time we used each color, I had to "prime" them by scribbling a little. It's like there is a clear wax coat on the tips, for protection maybe? The scents aren't super-strong, but still noticeable. Fruit punch stole the show.